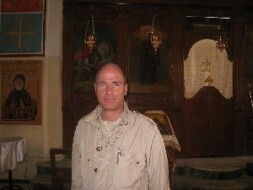 Dr. Hubertus Hoffmann, President of the World Security Network Foundation and promoter of The Human Codes of Tolerance and Respect, in a christian church in Jordan in the Holy Land:"Whoever kills Christians and Jews because they follow their own Holy Books contaminates the Koran in the worst way. Through these awful deeds the perpetrator makes of himself a disbeliever and excludes himself from the Islamic community, the Ummah. If the Prophet were alive today, he would be outraged both by such sins themselves but also by the passive inaction of most religious and political leaders in the Muslim world. He who stays silent now offends the Prophet too." When Al Qaeda or other radicals attack and kill Christians in Muslim countries like Egypt, Pakistan, Iraq or Indonesia "in the name of Allah and the Koran" they offend the Holy Book of more than one billion Muslims, they offend the Prophet and they offend Allah in the worst way possible as well. Killing civilians because they follow the religions of Abraham is blasphemy against Islam, and even during jihad is never allowed under Islamic rules. These severe sins are even more punishable than burning the Koran. Whoever kills Christians and Jews because they follow their own Holy Books contaminates the Koran in the worst way. Through these awful deeds the perpetrator makes of himself a disbeliever and excludes himself from the Islamic community, the Ummah. If the Prophet were alive today, he would be outraged both by such sins themselves but also by the passive inaction of most religious and political leaders in the Muslim world. He who stays silent offends the Prophet too. Therefore all those promoting violence against Christians, and the assassins themselves in Egypt, Pakistan, Iraq or Indonesia must be punished according to Sharia law. This should be done now, as a clear message of what the true teachings of Islam mean (see Dr. Hubertus Hoffmann: Punish terrorists according to Sharia as they offend the Prophet and Allah). The main task of Islamic religious leaders in the Muslim world now must be to stop the Koran being misused to justify killing civilians. Maybe one-hundred times more poor men and women of Islamic belief rather than Christians or Jews have been killed by bombs in Muslim countries like Pakistan, Afghanistan or Iraq, even in holy mosques. Who is defending the Prophet? Too few. Who defends the Koran against the sinners? Not many do. Who defends Allah against misuse of hate-propaganda? Only a handful of true believers. Who is defending the innocent people against killers? Too little; too late; too hesitating; is this the reality in the Muslim world? Have most of more than one billion Muslims forgotten to defend the Prophet against these sinners? Even though it is their religious obligation? Not for the first time in history, nations have lost their spirit, soul, honour and dignity: while Adolf Hitler's Nazi propaganda infiltrated the proud cultural nation of Germany, the dominating elites in politics, the military, churches, unions, culture and industry did too little and hesitated to stop this madman with his insane ideology - until it was too late. Instead, appeasement prevailed throughout Germany and also in Britain. Will this inaction when faced with mad ideology be repeated in Muslim countries? When faced with the choice, let alone the obligation, of defending true Islam against the preachers of hate, too many Islamic leaders and powerful politicians stay passive. Some even follow the sinful path of appeasement. Too few protest against the madness of killing civilians in the name of Allah strongly and in the public or take action against it. "Any good and true Muslim must defend the people of the books - Jews and Christians - out of religious duty. This is what the Prophet demanded from his followers and taught repeatedly, because the Koran and the teachings of the Prophet share much with the Bible and the Torah like the common fundamentals of Abraham. The Koran is based on the older books like a skyscraper on a strong fundament. When you destroy the fundament you attack Koran. Any good and true Muslim must defend the people of the books - Jews and Christians - out of religious duty. This is what the Prophet demanded from his followers and taught repeatedly, because the Koran and the teachings of the Prophet share much with the Bible and the Torah like the common fundamentals of Abraham. The Koran is based on the older books like a skyscraper on a strong fundament. When you destroy the fundament you attack the Koran. Mohammad the Prophet taught tolerance and respect towards Christians and Jews all his life. And do not argue with the followers of earlier revelation otherwise than in a most kindly manner - unless it be such of them as are bent on evildoing - and say: "We believe in that which has been be¬stowed from on high upon us, as well as that which has been bestowed upon you: or our God and your God is one and the same, and it is unto Him that We [all] surrender ourselves." "The notion that Muslims are commanded to spread their faith ‘by the sword' or that Islam in fact was largely spread ‘by the sword' does not hold up to scrutiny. Indeed, as a political entity Islam spread partly as a result of conquest, but the greater part of its expansion came as a result of preaching and missionary activity. Islamic teaching did not prescribe that the conquered populations be forced or coerced into converting. Indeed, many of the first areas conquered by the Muslims remained predominantly non-Muslim for centuries. Had Muslims desired to convert all others by force, there would not be a single church or synagogue left anywhere in the Islamic world. The command ‘There is no compulsion in religion' means now what it meant then. The mere fact of a person being non-Muslim has never been a legitimate casus belli in Islamic law or belief. As with the rules of war, history shows that some Muslims have violated Islamic tenets concerning forced conversion and the treatment of other religious communities, but history also shows that these are by far the exception which proves the rule. We emphatically agree that forcing others to believe - if such a thing be truly possible at all - is not pleasing to God and that God is not pleased by blood." Truly Islamic teaching and forbids any attack on Christians and Jews simply because of their religion. This is not a choice but a binding obligation on all Muslims worldwide. "Say: "We believe in God, and in that which has been bestowed from on high upon us, and that which has been bestowed upon Abraham and Ishmael and Isaac and Jacob and their descendants, and that which has been vouchsafed by their Sustainer unto Moses and Jesus and all the [other] prophets: we make no distinction between any of them. And unto Him do we surrender ourselves." Verily, those who have attained to faith [in this divine writ], as well as those who follow the Jewish faith, and the Christians, and the Sabians - all who believe in God and the Last Day and do righteous deeds - shall have their reward with their Sustainer; and no fear need they have, and neither shall they grieve. And We caused Jesus, the son of Mary, to follow in the footsteps of those [earlier prophets], confirming the truth of whatever there still remained of the Torah; and We vouchsafed unto him the Gospel, wherein there was guidance and light, confirming the truth of whatever there still remained of the Torah, and as a guidance and admonition unto the God-conscious. 5:47 Let, then, the followers of the Gospel judge in accordance with what God has revealed therein: for they who do not judge in the light of what God has bestowed from on high-it is they, they who are truly iniquitous! And unto thee [O Prophet] have We vouchsafed this divine write, setting forth the truth, confirming the truth of whatever there still remains of earlier revelations and determining what is true therein. Judge, then, between the followers of earlier revelation in accordance with what God has bestowed from on high, and do not follow their errant views, forsaking the truth that has come unto thee. Unto every one of you have We appointed a [different] law and way of life. And if God had so willed, He could surely have made you all one single community: but [He willed it otherwise] in order to test you by means of what He has vouchsafed unto, you. Vie, then, with one another in doing good works! Unto God you all must return; and then He will make you truly understand all that on which you were wont to differ. For, every community faces a direction of its own, of which He is the focal point. Vie, therefore, with one another in doing good works. Wherever you may be, God will gather you all unto Himself: for, verily, God has the power to will anything. And [because He is your Creator,] it rests with God alone to show you the right path: yet there is [many a one] who swerves from it. However, had He so willed, He would have guided you all aright. And if thy Lord willed, all who are in the earth would have believed together. Wouldst thou (Muhammad) compel men until they are believers? Say: "We believe in God, and in that which has been bestowed from on high upon us, and that which has been bestowed upon Abraham and Ishmael and Isaac and Jacob and their descendants, and that which has been vouchsafed by their Sustainer unto Moses and Jesus and all the [other] prophets: we make no distinction between any of them. And unto Him do we surrender ourselves." In matters of faith, He has ordained for you that which He had enjoined upon Noah - and into which We gave thee [O Muhammad] insight through revelation as well as that which We had enjoined upon Abraham, and Moses, and Jesus: Steadfastly uphold the [true] faith, and do not break up your unity therein. Because of this, then, summon [all mankind], and pursue the right course, as thou hast been bidden [by God]; and do not follow their likes and dislikes, but say: "I believe in whatever revelation God has be¬stowed from on high; and I am bidden to bring about equity in your mutual views. God is our Sustainer as well as your Sustainer. To us shall be accounted our deeds, and to you, your deeds. Let there be no contention between us and you: God will bring us all together - for with Him is all journeys' end." Say [to the Jews and the Christians]: "Do you argue with us about God? But He is our Sustainer as well as your Sustainer - and unto us shall be accounted our deeds, and unto you, your deeds; and it is unto Him alone that we devote ourselves. Brig Gen (Retd) Dr.Muhammad Aslam Khan Niazi:"The Muslim world must follow the Prophet in a real jihad for tolerance. The silent majority must forget its cowardice and confront the forces of evil in the name of both the Holy Koran and Allah. Needed is a new jihad to defend the true teaching of the Prophet and to contain and roll-back the sinners of hate and murder of too many Muslims, Christians and Jews now." Did the Prophet kill Christians or Jews because they were unbelievers? Muhammad himself showed tolerance and goodwill towards the Christians of his time. The Prophet was a living example of tolerance and respect to the older religions of Judaism and Christianity, contrary to anti-Islamic hate propaganda and the perception in some Western media. When the Abyssinian Christian delegation arrived in Medina, the Prophet provided them with lodging even in his own Mosque, and he himself attended to their hosting and service saying: "They have honoured our people, so I like to honour them myself." When the Christians of Najran came to Medina, the Prophet lodged them too in the Mosque and permitted them to hold their prayers on one side of the Mosque with Muslims on the other side. In this Mosque, dialogues between Christians and Muslims were conducted with freedom, respect and tolerance. Holiness in Islam was inclusive rather than exclusive. If they wished, Jews and Christians could worship in the new mosque of the Prophet finished in April 623 in Medina, because they too were part of God's family with Abraham as the common father and Jesus and others as prophets before Muhammad. "This is a message from Muhammad ibn Abdullah, as a covenant to those who adopt Christianity, near and far: we are with them. 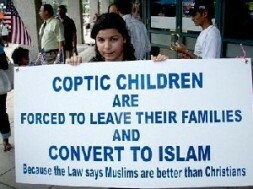 Verily I, the servants, the helpers, and my followers defend them, because Christians are my citizens; and by Allah! I hold out against anything that displeases them. No compulsion is to be on them. Neither are their judges to be removed from their jobs nor their monks from their monasteries. No one is to destroy a house of their religion, to damage it, or to carry anything from it to the Muslims' houses. Should anyone take any of these, he would spoil God's covenant and disobey His Prophet. Verily, they are my allies and have my secure charter against all that they hate. No one is to force them to travel or to oblige them to fight. The Muslims are to fight for them. If a female Christian is married to a Muslim it is not to take place without her approval. She is not to be prevented from visiting her church to pray. Their churches are to be respected. They are neither to be prevented from repairing them nor the sacredness of their covenants. No one of the nation (Muslims) is to disobey the covenant till the Last Day." This charter of privileges has been honored and applied faithfully by Muslims throughout the centuries in all lands they ruled. Seventeen of the Jewish tribes in Medina lived with the new Muslim community in peace for many years. Even the exiled, hostile Jewish tribe of Nadir asked for peace with the victorious Muhammad. To seal the agreement, he took the daughter Safiyyah of his old enemy Huyay, chief of Nadir, as his wife telling her "Your father is Aaron and your uncle is Moses". Later, Jews enjoyed full religious liberty in the Islamic empires until the Palestine-Israel conflict started only 60 years ago. The main aim of the respected Prophet Muhammad more than 1,300 years ago was to bring peace to the different tribes in Mecca and the Arab Peninsula, to create a better society of din and hilm and to reduce the negative forces of jahiliyyah and revenge. The Muslim world must follow him in a real jihad for tolerance. The silent majority must forget its cowardice and confront the forces of evil in the name of both the Holy Koran and Allah. Needed is a new jihad to defend the true teaching of the Prophet and to contain and roll-back the sinners of hate and murder of too many Muslims, Christians and Jews now. We need a global promotion of The Human Codes of Tolerance and Respect (see www.codesoftolerance.com).